Hello! My name is Megan, I am fairly new to this practice but I have already learned so much! I have been in the optical industry for about four years and I enjoy this profession greatly. 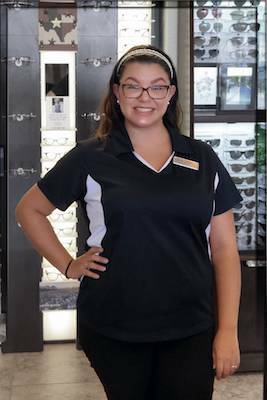 I love helping patients with frame selections or with any questions they have regarding glasses or contact lenses. I am here to help in any way I can and my main goal is making sure our patients leave here with a wonderful experience. I am newly married this year and my husband and I have a seventeen month old son who runs our world. We enjoy trips out to Canyon Lake and going to South Padre beach whenever we can make it! In case of emergency, please call our office at (210)590-2482.If you are unable to speak to a staff member, please proceed to the nearest emergency room.